Welcome to Ipe Decking Florida! We love our decks in Florida. They become another room in our home. A lot of families are found on their decks every night. Restaurants use the quality and usability of their deck as a way to compete. In short, Florida loves decks. Excessive moisture makes mold and mildew a huge threat. Florida has the most voracious termites in the U.S.
Florida Decks are often built on ground that's soft and shifting. Fortunately, our ipe decking is perfect for harsh conditions such as those found here in Florida. When you consider that it comes from the jungles of Brazil, where the climate is even harder on wood products, then it makes perfect sense. 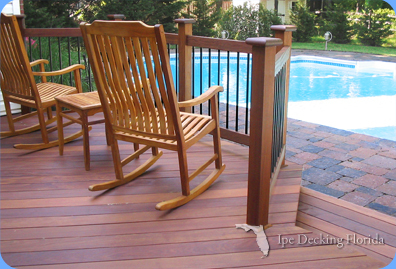 Ipe decking is naturally resistant to mold, decay, and insects. Our ipe decking is imported directly from South America, so we can cut costs and save you money. Contact us today to order a new ipe deck. *IpeDeckingFlorida.com currently ships hardwood decking to all areas in Florida. We are planning on opening a showroom in the coming months and are reviewing possible locations. If you have questions about getting Ipe, Cumaru, Tigerwood or Garapa decking shipped to your local jobsite, please contact us. You’ll find that our support staff is very knowledgeable and eager to help.